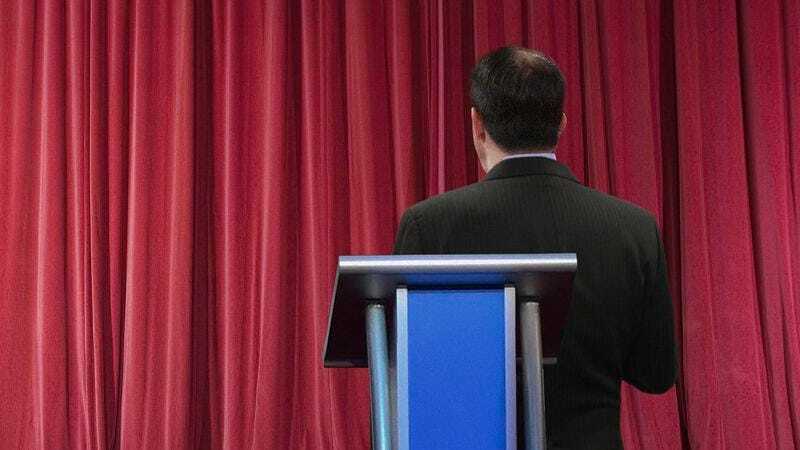 SIMI VALLEY, CA—Upon noticing that the Wisconsin governor had become disoriented during one of the moderator’s questions and begun delivering his response while facing the set’s backdrop, several of his aides rushed on stage during Wednesday’s GOP primary debate to rotate Scott Walker back in the direction of the audience. “It’s not unusual for him to get a little confused up there, what with all the bright lights and people talking on all sides, so if we see him starting to drift away like that, a couple of us will just hop up there and turn him back the right way,” said senior aide Kyle DeBacker, who added that Walker campaign staffers were almost always able to catch the presidential candidate before he’d wandered too far from his podium and could often redirect his gaze by snapping their fingers in the direction they wanted him to look. “The only time it’s a real problem is when he meanders too far from the microphone in the middle of an answer and we have to stay at his side until we can coax him to repeat whichever part the audience didn’t get to hear. Otherwise, we’re just glad he’s stayed standing for the whole debate so far tonight instead of lying down on the floor while the other candidates are talking like he usually does.” At press time, a distracted Walker had taken a seat on the edge of the debate platform and was absentmindedly banging his feet against the side of the stage.